Every now and then, I see a new product on the market that gets me excited. Occasionally, there have been times when I have been lucky enough to have played an integral role in creating the product; other times suggesting and recommending the idea for the product. Being in the nutrition and supplement industry as long as I have--with a marketing background as well-- I often come up with products/flavors that I can see being enjoyed by the vast majority of the public. In this case, I merely suggested some flavors. I have been making "frozen yogurt" for as long as I can remember, and lately have been trying every yogurt under the sun. I emailed the people at Danone silhouette yogurt with a few questions/comments, among which I suggested some flavors that I would love to see their products selling and incorporating into their line. I am sure they have had thousands of requests, and mine just added to the already massive heap ( I must have sent approximately 25 suggestions--including cappuccino, coconut cream, a few pie/desserts, Tiramisu etc). Yesterday, while browsing the dairy isle at my local grocery store, ready to pick up my normal products, Silhouette's new packaging for their 16 packs caught my eye.... and so did their new "limited edition flavors". Having shamelessly professed my love of all things coconut, I have been searching high and low for a sugar free fat free coconut flavored yogurt. They have these in Europe at every corner store and yet aside from Liberte's fantastic Mediterranean line, have found barely any. Cappuccino, Caramel, Lemon Cake and Coconut Cream! Naturally, I snatched a pack up immediately. Despite the fact that Silhouette by Danone is much thinner and less creamy than the other 2 brands making fat free/sugar free delicious yogurts (Source and Astro Zero), possibly due to gelatin content, I still do enjoy these yogurts very much. 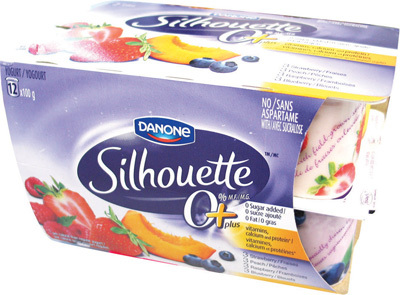 As with the other 2 brands, Silhouette claims to have only 35 fat free*, sugar free** calories per container or 100 grams. 6g carb*4+(3g protein *4cal)=(0.4*9g fat)= 39.6 calories= 40 calories, and this is minimum. My favorite way to enjoy them is with PGX granules sprinkles stirred in ( I sometimes add some sugar free syrup), or frozen! I will be posting a recipe for my go-to easy frozen yogurt in the future, so stay tuned!!! The key to making it properly is the container you freeze it in and the consistency of the yogurt itself. I find that if I don't do these correctly, the silhouettes sometimes form ice crystals, whereas the other 2 brands are less inclined to do so. However, their yogurts are wonderful and very versatile. I like their new flavors-- they are nice, smooth, mild, and not at all over powering. Silhouette has a nice variety of 17 flavors and I enjoy their limited editions! I hope these stick around for a long time! (b) less than 0.5 g of fat per serving of stated size, if the food is a prepackaged meal. Danone achieves a fat-free yogurt by a skimming process with its milk to extract dairy fat. During Silhouettes' skimming operation, fat is separated from the milk which results in two products: skim milk and cream." Silhouettes has no sugar added which means it does not contain added: white sugar, a food that contains white sugar, brown sugar, syrup, molasses, glucose, honey or fructose. Silhouettes uses a sweetener called sucralose. That said, "no added sugar" doesn't mean there is no sugar in the product. 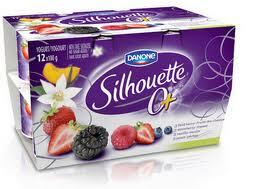 Silhouettes contains sugar in its natural form from milk (lactose) and fruit (fructose). Silhouettes Plain is the only flavour that does not contain fructose. All for just 35 calories per servingCoconut Creme Fat-free flavour with no added sugar. Plain: Skim milk, milk and whey proteins, modified corn starch, active bacterial culture, gelatin, vitamin A palmitate, vitamin D3, made with vitamin A & D fortified skim milk. Not perfect, but not bad either. I also love Greek yogurt!